Get MORE for LESS! Order two or more packages of Brochures and SAVE 15%! 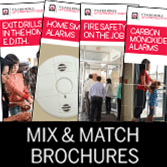 NFPA® Brochures are a popular way to reach the people in your community with important fire safety messages, strategies, and tips on everything from properly using fire extinguishers and preventing fire in the kitchen to identifying hidden hazards in the home. With so many important messages to bring to the community to help keep families, children, and workplaces safe, you will want to have multiple NFPA Brochures on-hand. They can be used as handouts at community and special events, at fire station open houses, in the workplace, at community and senior centers, and libraries. 10 Tips for Fire Safety Brochures - Ten simple, easy-to-follow tips for fire safety everyone can follow, from cooking, smoke alarms, candles, and escape plans to electrical hazards, space heaters, and more. Cooking Fire Safety Brochures - Nearly two dozen tips inside this brochure can help prevent scalds and burns, potholders, towels, and clothes from catching fire, prevent electrical fires, and more. Fire Extinguishers at Work Brochures - Fire extinguisher fundamentals for the workplace succinctly demonstrate the Pull, Aim, Squeeze, Sweep (P.A.S.S.) method of putting out fires -- and explains the different types of fire extinguishers. Ways to Keep Your Family Safe From Fire Brochures (formerly Home Fire Prevention Checklist) - Safeguard lives and property in your community with this 23-point checklist covering smoke alarms, electrical, heating, smoking, and cooking. NEW! Smoking & Fire Safety Brochures - Teach people in your community how to properly dispose of tobacco products and keep their homes, families, and environment safe and protected. NEW! Hidden Hazards Brochures - Spread the word about the often overlooked hazards in the home such as 9-volt batteries, compact fluorescent light bulbs (CFLS), lint filters, and water heaters in closets. NFPA's high-quality Brochures deliver key messages across the fire safety spectrum that are critical to helping save lives and prevent fires. And, they come from a source you can trust...NFPA. Buy 2 or more packages of Brochures and get a great deal!